In this Photoshop Effects tutorial, we're going to look at how to recreate the same color and motion blur effect used in the movie poster for the biggest action movie of the 2007 summer, the Bourne Ultimatum. We'll be using Photoshop's Hue/Saturation adjustment layer to colorize the image using a color I've sampled directly from the poster itself. 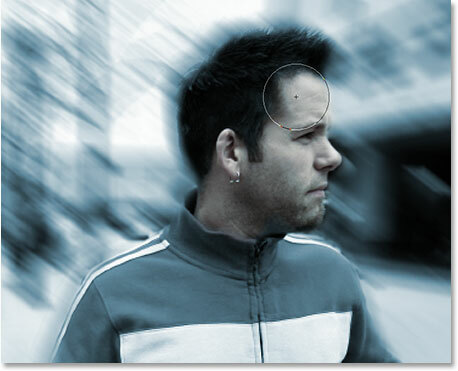 To create the motion blur, we'll be using Photoshop's classic Motion Blur filter, and we'll be finishing off the effect with a couple of layer masks to bring back just a hint of the flesh tones from the original image, as well as to remove the blur effect from the main subject. To complete this Photoshop tutorial, you'll need a photo of Matt Damon walking towards you looking a little upset about something and carrying a gun. 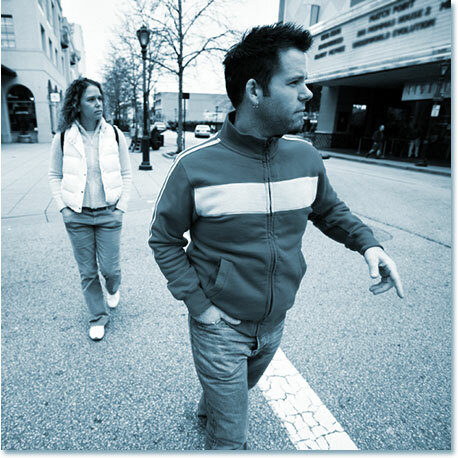 If you don't happen to have a photo like that (and hopefully you don't), any photo of someone walking towards you on the street will do. 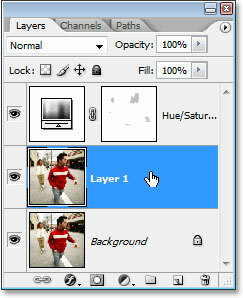 The Layers palette showing the original image on the Background layer. 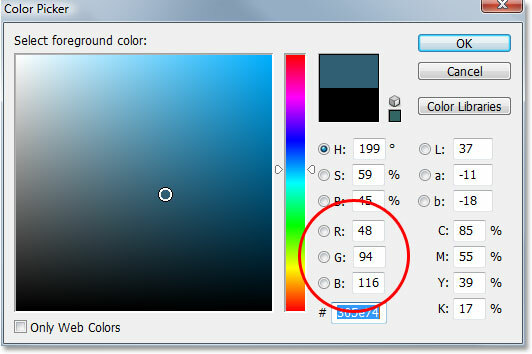 Click on the Foreground color swatch near the bottom of the Tools palette. Use the Color Picker to choose the color you want to colorize the image with. Photoshop colorizes the image with our chosen Foreground color. 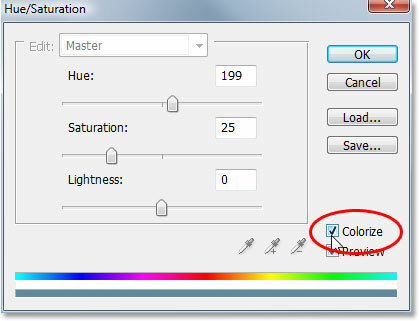 Click OK to exit out of the Hue/Saturation dialog box. Reset the Foreground color to black by pressing "D" on your keyboard. Lower the opacity of your brush to around 30%. This way we'll only be bringing back 30% of the original color rather than the full amount. 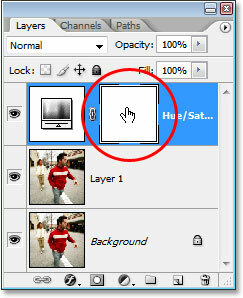 Select the layer mask by clicking on its thumbnail in the Layers palette. 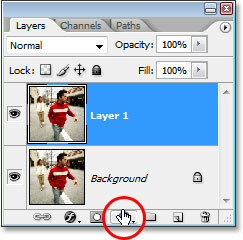 You'll know that the layer mask is selected because it will have a white highlight border around the thumbnail, as we can see in the image above. Paint with black to reveal some of the original skin tone. If you accidentally paint over an area you didn't mean to paint over, simply press X on your keyboard to switch your Foreground color to white and paint over the mistake, then press X again to switch back to black and continue painting. The image after bringing back some of the skin tones. At this point, we're done colorizing our image. Next, we're going to add the motion blur effect. 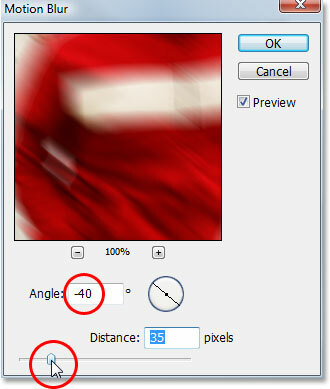 Set the "Angle" to -40°, then adjust the blur distance with the slider at the bottom. 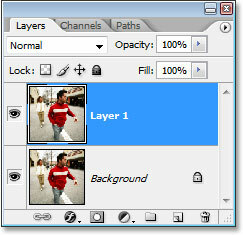 The Layers palette now showing the layer mask thumbnail on "Layer 1". 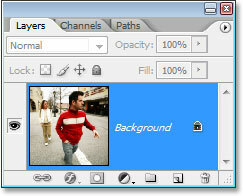 I can now use this layer mask to hide the motion blur from in front of the two people in my image, which I'll do next. 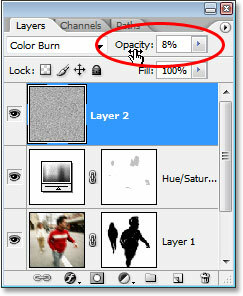 Set the opacity of the Brush Tool back to a full 100% in the Options Bar. Paint with black over areas to hide the motion blur. The image after painting away the motion blur effect in front of the guy. Both people are now showing through the motion blur. 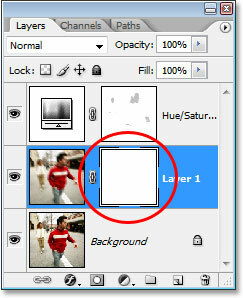 Select the Hue/Saturation layer in the Layers palette, then click on the "New Layer" icon. 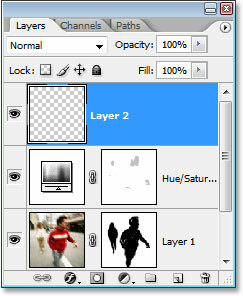 A new blank layer is added to the top of the Layers palette. We need to fill this new layer with white, and since white is currently our Background color, we can use the keyboard shortcut Ctrl+Backspace (Win) / Command+Delete (Mac), which tells Photoshop to fill the layer with the Background color. The image will now appear completely filled with white. I won't bother showing a screenshot, since a white image on a white background wouldn't look very interesting. Go to Filter > Noise > Add Noise to bring up the Add Noise dialog box. 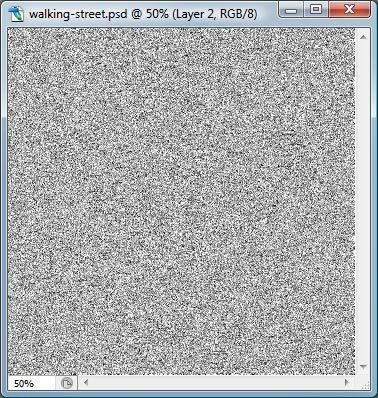 The image after filling the top layer with noise. 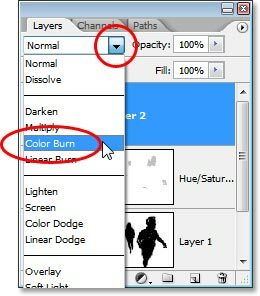 Step 15: Change The Blend Mode Of The Noise Layer To "Color Burn"
Change the blend mode of the noise layer to "Color Burn". 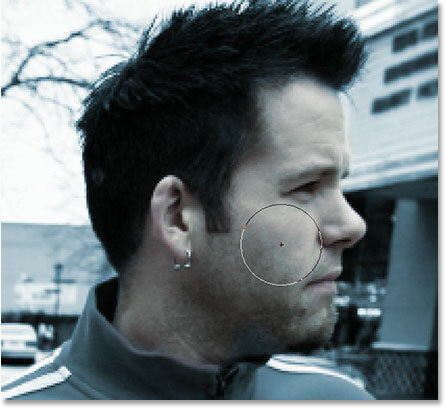 Lower the opacity of the noise layer to 10% or less so the noise is just barely visible. And there we have it! That's how to create a Bourne Ultimatum-inspired color and motion blur effect in Photoshop! Check out our Photo Effects section for more Photoshop effects tutorials!